1 Cut 2 pieces of beading wire to 2 feet each. Center a soldered gold loop on both pieces, and pass all four ends up through a large gold bead and a large glass bead. Split the wires, and string 2 up through each hole in the V pendant. 2 String each pair of wires through a large gold bead. 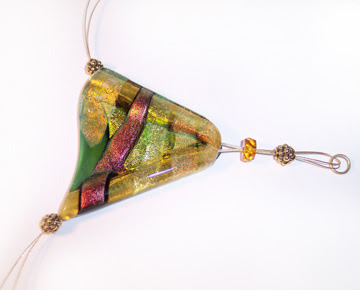 String the rest of the two necklace strands, alternating between small beads and seed beads on a single wire and larger beads on both wires for about 4 to 5 inches. 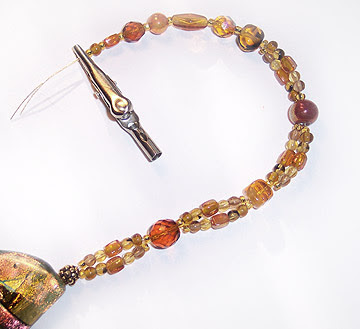 String both wires through several large beads, and finally through about 1/2 inch of smaller beads. 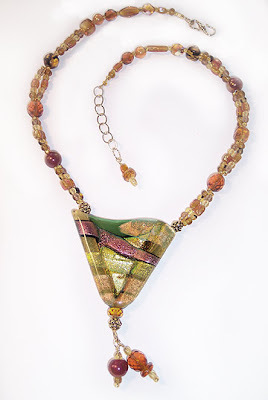 3 Create 2 dangles on headpins and make wrapped loops around the soldered ring below the V pendant. 4 Use crimps to attach the loose ends of the beading wires on one side to a soldered gold ring, and to a 2 inch piece of chain on the other side. Attach a gold hook to the ring. 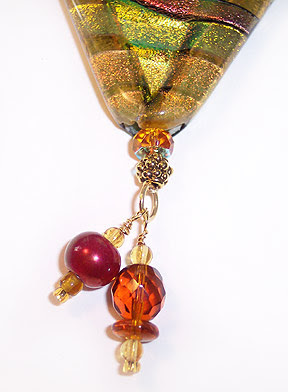 Create another small dangle on a headpin, and make a wrapped loop around the loose end of the chain.